Dr. Krishnendu Dutta, Assistant Prof. in Mathematics obtained his B.Sc(H) from St Xaviers College & got M.Sc, & PhD. (Sc.) in Pure Math from Calcutta University. He is the Ex head of the Department of of Mathematics at Future Inst. of Engg & Mgt and also HOD of Dept of Math ,Krishnanagar Govt. College. 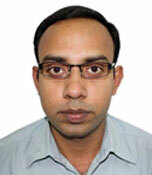 He has a teaching experience of nine years both Engg. Math and Degree Honours Mathematics course.He has eleven years of research experience & carried out different research projects. His research area includes Set Topology, Fuzzy Topology, Functional analysis etc. He has a good number of National & International publications in his credit. He has recently visited University of Texas, USA to deliver an invited talk on “Fuzzy Function Space”.